The process had begun. After several days filled with frustration and aggravation, I knew that I had to get out and get that grill going, no matter the weather. And as any frequent griller can attest to, the act of grilling is paramount to therapy. Those wispy, thin ribbons of blue smoke are always relaxing and even a bit seductive, similar to a genie in a bottle. The object of my attention was a whole chicken, around four pounds, that through no fault of its own, became the perfect volunteer to become dinner. 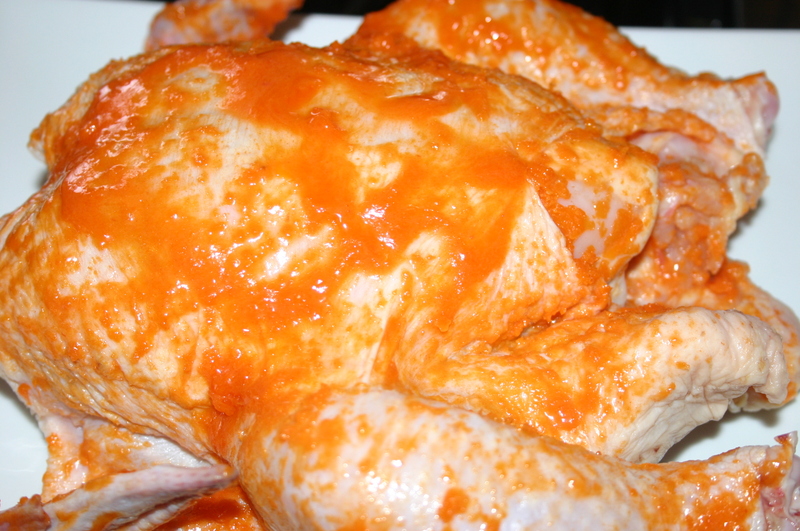 But first, I decided to marinade the naked bird overnight in a generous slathering of plain greek yogurt. Now you may ask why I decided to do this, and all I can say is that the idea struck me as the right thing to do. I had never tried it before, but I’m hoping that the yogurt will help keep the bird tender and juicy on the smoker, similar to soaking chicken in buttermilk before frying. And before you question this decision, here’s something else to think about. 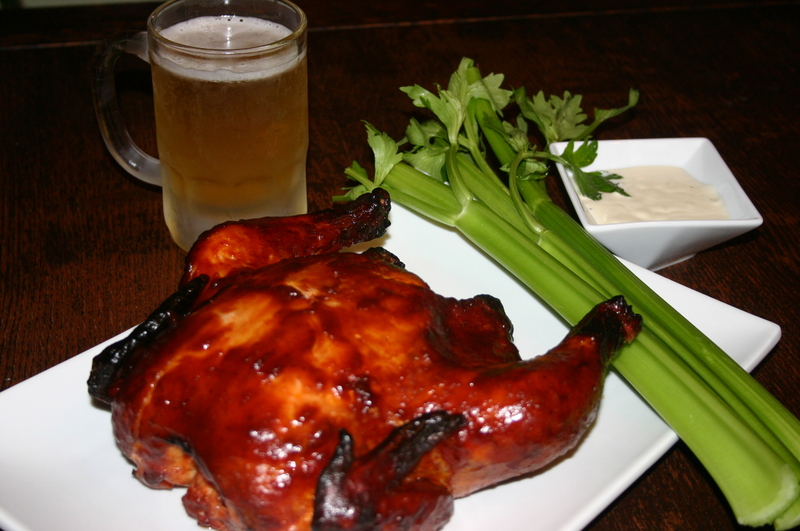 When you get asked, and you know you will, “Have you ever massaged a naked chicken with yogurt?”, how will you be able to respond? Well, we all know how I will respond now, don’t we? Nevertheless, the yogurt covered bird is then put into a large Ziploc bag and refrigerated overnight. The next day, when youre’ ready to start smoking, take the bird out of its yogurt induced sleep, and rinse it off well. 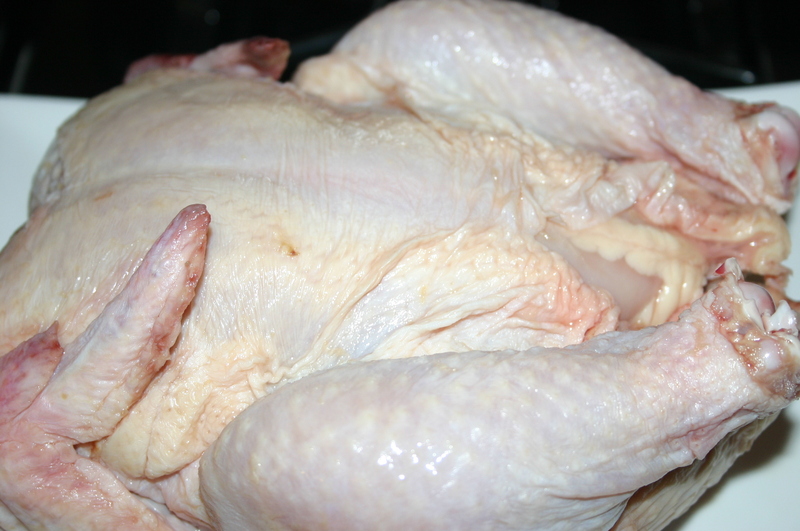 Pat the bird dry, and lay it down to start the seasoning process. You’ll notice that the chicken is a bit more relaxed at this point, kind of “loosey-goosey”, for those that prefer the technical term, signifying that the chicken did indeed enjoy the yogurt soak. 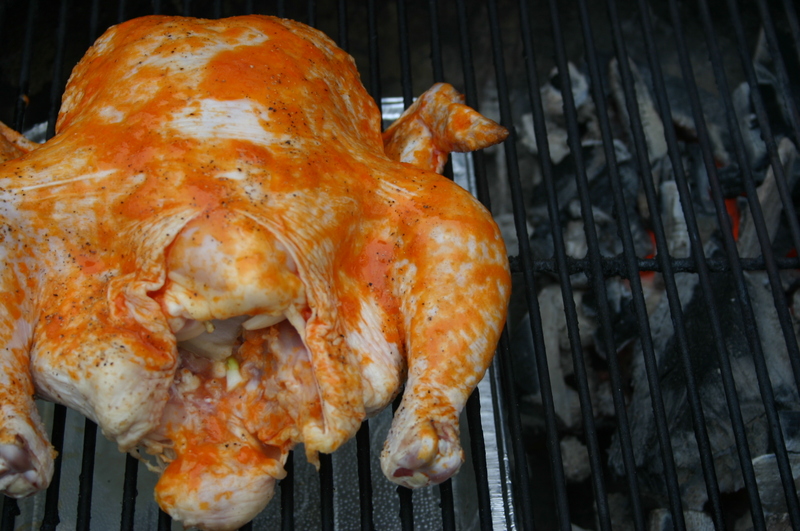 After a quick grinding of black pepper over the top of the chicken, my therapy session continued with the chicken being carefully laid down on the grill, over a water pan, opposite the side of the grill with those burning coals. Yeah, a nice slow, indirect cook for this small chicken with big expectations. Toss in your wood of choice for the smoke and put the cover on. With a cook time expected of roughly a couple of hours at medium to low heat, rotate the chicken after about forty-five minutes to help with even cooking and browning. During the last thirty to forty minutes, I increased the bird’s anger level by slathering on a barbecue sauce mixed with still more cayenne sauce. 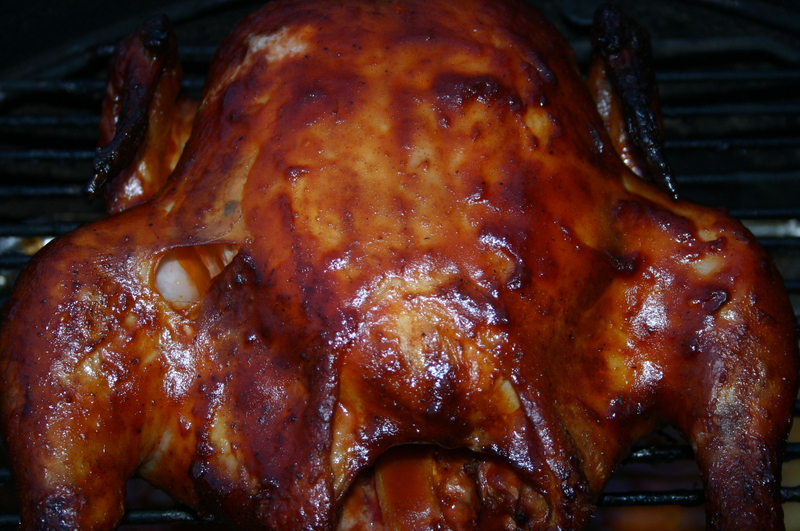 This allows the sauce to caramelize and coat the bird while completing the cooking process. 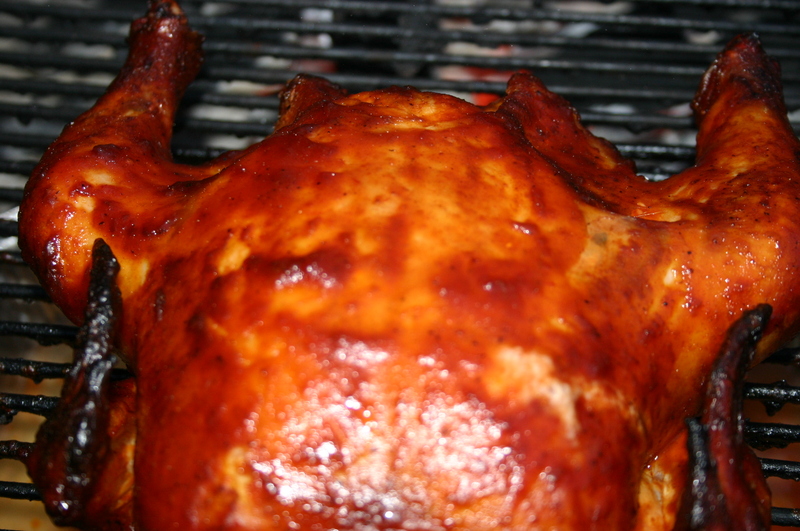 Once the internal temperature has reached the 165 degree mark, take the chicken off the grill and let rest on a platter. 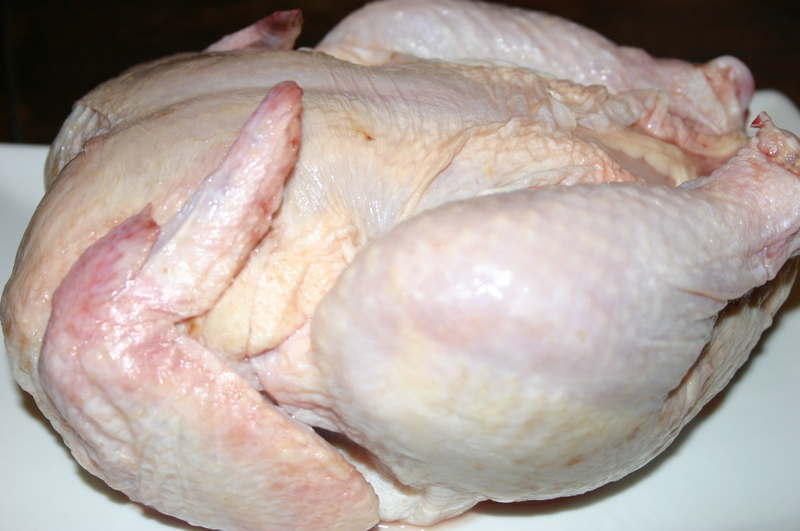 The chicken can also be tested by simply rotating the leg. If it moves easily, with no resistance, it’s a cooked bird. I really didn’t know what to expect out of this Angry Bird. 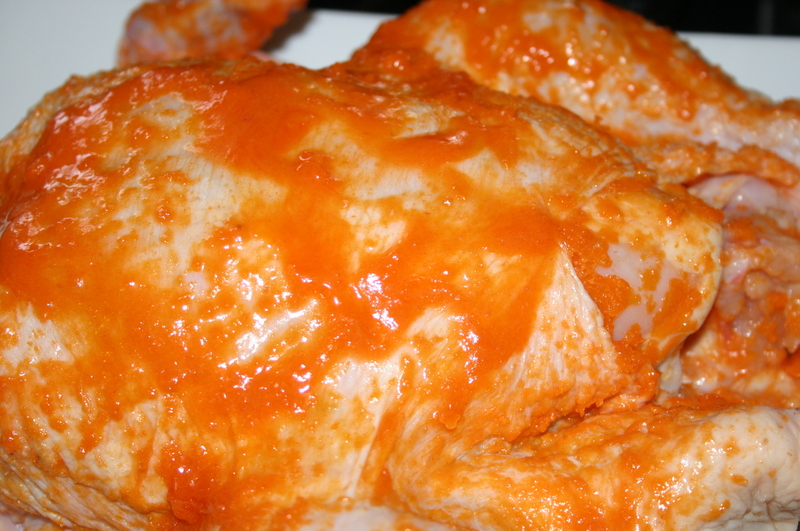 But after the yogurt spa session, the buffalo sauce injections, and the barbecue sauce baste, this chicken came out picture perfect while also being one of the most tender, flavorful, and juiciest birds that you can imagine. And hey, adding in a cold frosty brew is never a bad idea either. Life Is Better Wood Fired. Could this be put on a rotisserie in a Weber 18.5″ Rocky Mountain smoker with the same results? I plan on putting one on mine as I have a couple of spares. Thank you Peter in Pontypool On..
Peter, I think it would be outstanding on a rotisserie. Same principles, just a little more hassle free. Twirl that angry bird, and enjoy. Thanks for your interest! Well I’ll be. I’ll admit, I never would have thunk to rub a bird in yogurt. You are becoming a pioneer in experimental bbq! Looks like it worked pretty good too. Always a pleasure when I visit your blog here. Well done, Sir. Thanks PoP. While I’ll never compare our winters to those that you go through, this year has been one of those that will drive a man to try some unconventional things. And while it seemed a bit awkward at first, I thought if they can soak chicken in buttermilk before frying, well than this bird will surely enjoy a yogurt massage. And it did. That chicken was the most tender, juiciest poultry that we’ve had in quite a while. I appreciate your comments.